A textured and nostalgic piece, the Artemis crystal side comb is minimally chic with a nod to antiquity. Nuanced with muted tones of empire blue set upon antique silver tones, the Artemis comb hints at Art Deco heritage while balancing a modern silhouette. The enduring romantic appeal of the Artemis comb is matched with a fine appreciation for wild flowers and overgrown foliage – a timeless combination for the modern bride seeking a touch of old world charm. The empire blue details add a subtle “something blue”. We are happy to substitute the blue with silver crystal details upon request. *LIMITED QUANTITIES – Due to the popularity of the Artemis comb, we have limited materials available to create this design. If you love this comb, we recommend you secure it before we are no longer able to recreate it. The Artemis headpiece is ready to ship. Please allow 5-7 business days for processing plus delivery times. For the bride in love with antique finery and vintage details, the Artemis comb is sure to delight. We love to style Artemis with lace wedding dresses – the intricate details across the piece complement fine floral and leaf patterns of delicate laces. Artemis may be small but its exquisite details make it a standout piece. We love to pair it with or without a wedding veil with the Artemis secured to the side. 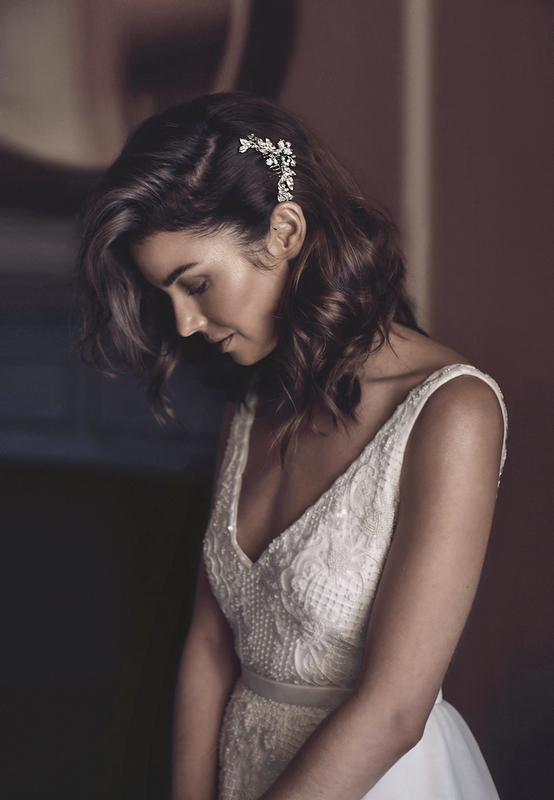 We recommend pairing this comb with a raw edge veil, a scalloped lace veil or a silver crystal encrusted veil to let the beauty of this intricately detailed piece take centre stage. Browse our full veil collection or contact us and we’d be happy to offer a recommendation to suit the Artemis based on your wedding dress and hairstyle. Please note: the subtle blue details can be replaced with silver or ivory details upon request.